Abstract: The assessment of corneal staining is a commonly conducted procedure in both clinical practice and as part of various research studies. Different grading scales are employed by many clinicians and researchers to undertake this procedure for corneal staining comparisons between eyes, products and over time. This paper describes the development and use of a grading scale for corneal staining undertaken at an academic research site. 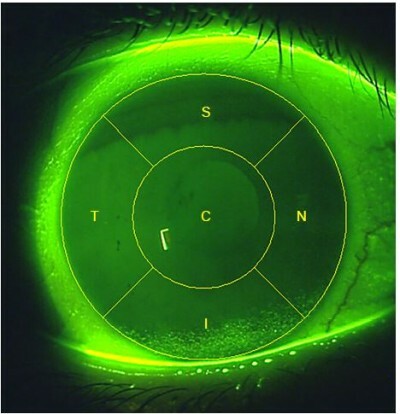 The scale involves assessment of three factors across five corneal zones: type, area and depth. Staining type and area are graded on a 0–100 scale, and depth is graded on a 0–4 scale. These factors can be combined to create a three- or two-factor staining grade, or the factors may be reported individually. An additional benefit of this scale is that the staining scores may be reported by zone as “zone staining scores” or the scores of zones may be combined to provide an overall corneal “global staining score”.